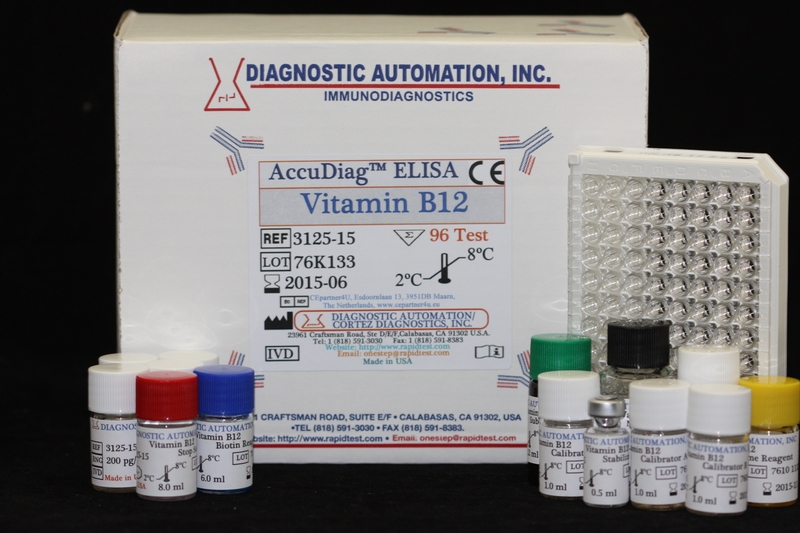 The Diagnostic Automation Inc 25-OH Vitamin D (total) ELISA is an enzyme immunoassay for the quantitative measurement of total 25-OH Vitamin D (Vitamin D2 and Vitamin D3) in serum and plasma. Vitamin D is a fat soluble steroid hormone involved in the intestinal absorption of calcium, iron, magnesium, phosphate, and zinc. Vitamin D3 (cholecalciferol) and Vitamin D2 (ergocalciferol) are the major forms of Vitamin D in human. The source of D2 and D3 can be both from the diet and from supplements. However, very few foods contain vitamin D. Vitamin D, specifically D3 can also be produced from a cholesterol precursor, 7-dehydrocholesterol, in the skin during sun exposure. D 2 is obtained from plant sources and only represents less than 5% of the total Vitamin D in the body. In the liver, the Vitamin D is hydroxylated to 25-hydroxyvitamin D (25-OH D), the major circulating metabolite of Vitamin D. Vitamin D and 25-OH D enter the circulation bound to Vitamin D binding protein (VDBP). Upon request, a small portion of 25-OH D is further hydroxylated in the kidney to form the biologically active hormone 1,25 dihydroxyvitamin D (1,25-(OH)2 D). This process is tightly regulated by the concentration of 1,25-(OH) 2 D, parathyroid hormone, hypophosphatemia and ionized calcium levels. Concentrations of 1,25-(OH)2 are about 1000-fold lower than that of 25-OH D. Although 1,25-(OH)2 D portrays the biological active form of Vitamin D, it is widely accepted that the measurement of circulating 25-OH D provides better information with respect to patients Vitamin D status and allows its use in diagnosis of hypovitaminosis. The concentration of 25-OH D decreases during winter time (reduced sun exposure), with dark skin color and with age. Determination of 25-OH D in serum or plasma will support the diagnosis and therapy control of postmenopausal osteoporosis, rickets in children, osteomalacia, renal osteodystrophy, neonatal hypocalcemia and hyperparathyroidism. 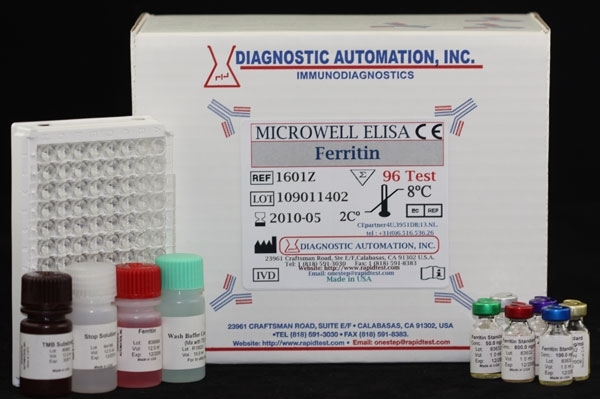 The 25-OH Vitamin D total ELISA Kit is a solid phase enzyme-linked immunosorbent assay (ELISA) based on the principle of competitive binding. In the first step, samples have to be pretreated in separate vials with denaturation buffer to extract the analyte, since most circulating 25-OH Vit D is bound to VDBP in vivo. After neutralization, biotinylated 25-OH Vitamin D (enzyme conjugate) and peroxidase-labeled streptavidin- (enzyme complex) are added. After careful mixing, the solution is transferred to the wells of the microtiter plate. Endogenous 25-OH Vitamin D of a patient sample competes with a 25-OH Vitamin-D3-biotin conjugate for binding to the VDBG that is immobilized on the plate. Binding of 25-OH Vitamin D-biotin is detected by peroxidase-labeled streptavidin. Incubation is followed by a washing step to remove unbound components. The color reaction is started by addition enzyme substrate and stopped after a defined time. The color intensity is inversely proportional to the concentration of 25-OH Vitamin D in the sample. See product insert for more details.